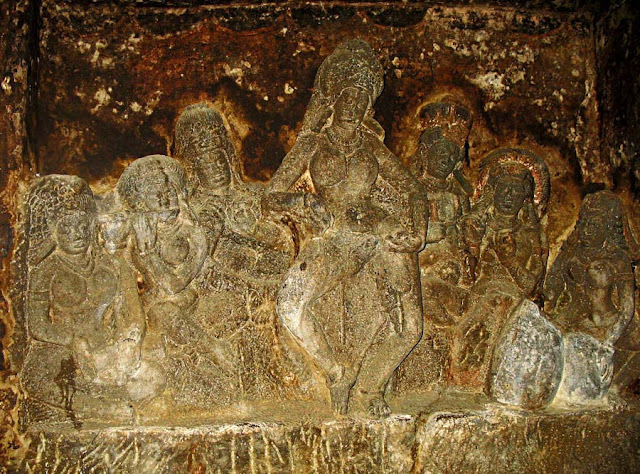 These are sculptures from the Aurangabad Caves. 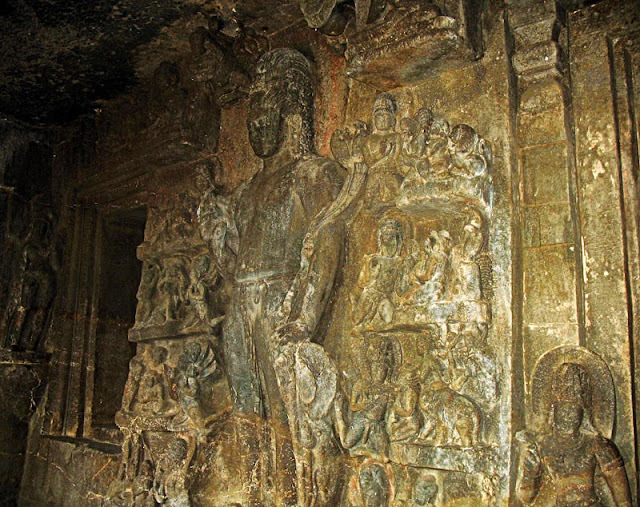 The dozen caves are a treasurehouse of art and sculpture going back almost ten centuries. These Buddhist caves are often neglected due to the presence of the Ajanta and Ellora caves nearby. These 12 rock-cut Buddhist shrines house amazing ancient sculptures of Buddha and numerous other figures, many of them women. These sculptural carvings of Aurangabad Caves are true Indian classical art and are equal in artistry to those at Ajanta or Ellora. 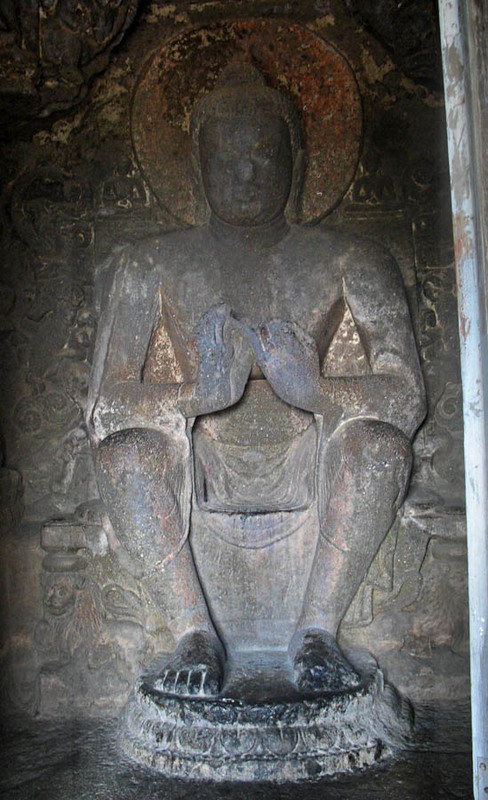 This is a figure of Buddha inside and inner sanctum of the caves. Bits of faded paint is visible even now, after hundreds of years! 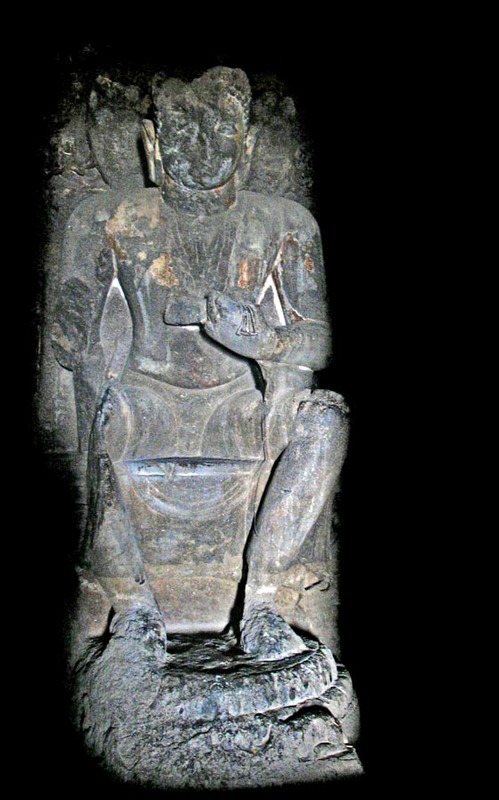 Another figure of Buddha inside a cave. The artist could be representing apsaras or angels - mythical figures or they could be simply devotees of Buddha, ordinary women who worshipped him. The woman in the middle seems to be a dancer. Unfortunately most of these sculptures lie neglected with rat and bat droppings all around. The caves also stink of rat and bat droppings. Such beautiful art should be restored and somehow protected from wild animals, birds and also the ravages of the weather and dampness. 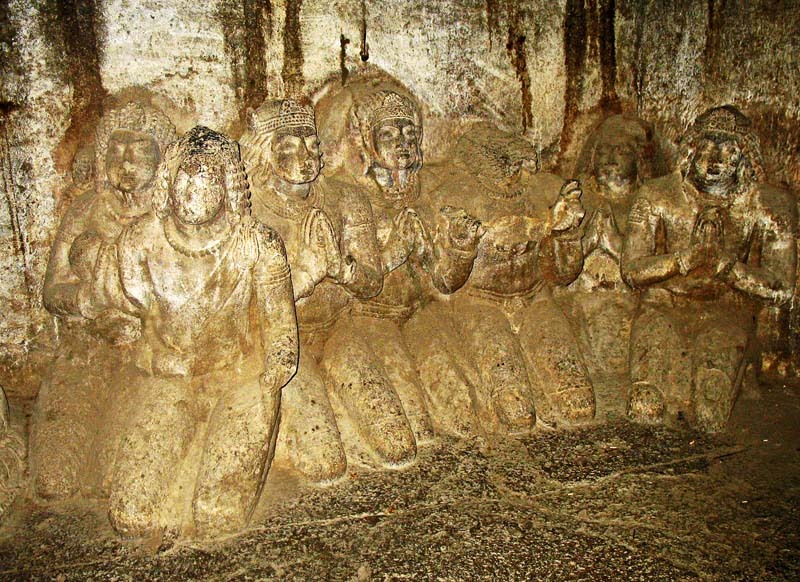 A group of female devotees kneeling have been carved into the walls of the cave. One of them appears to be clapping her hands. Could she be singing? This is a fresco showing Buddha and an entourage on the walls of the caves. The paint is now gone, but the remnants can be seen. 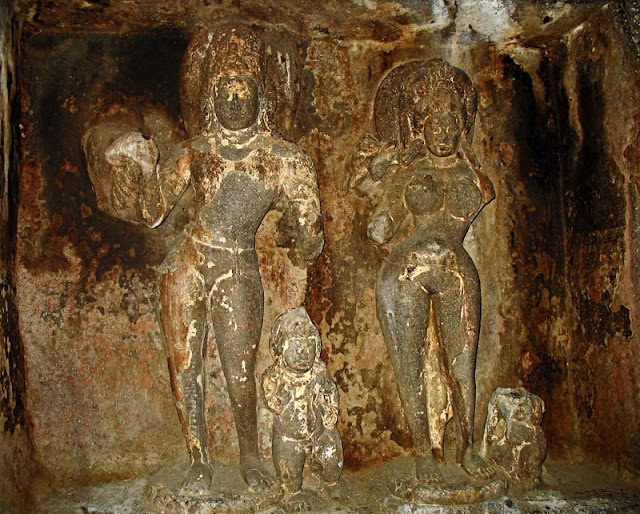 A couple with a child carved into the inside of the cave. The man appears to be carrying something. Perhaps gifts for Buddha? Related Pictures: Check out all images filed under Aurangabad Caves which includes pictures of the Aurangabad Caves Exteriors as well as carvings and other Indian classical art from these caves. Or check out all images filed under Ajanta and Ellora or try the label Buddhism for sculptures and shrines of Buddha from different parts of the world.